Living rooms should be both comfortable and welcoming, and that’s how I designed mine! Blue and white is such a classic color combination so I chose the lovely duo for my great room. I just love the high vaulted ceilings and the tall wainscot paneling on the walls! 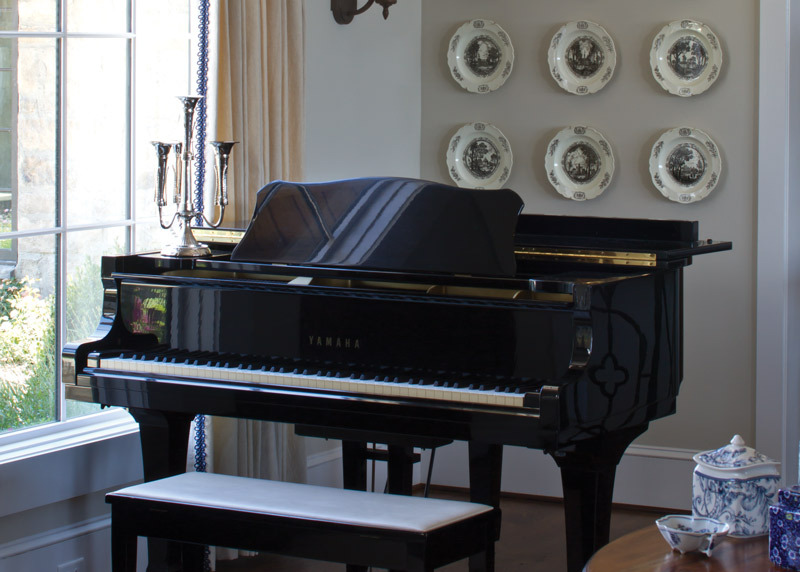 My black grand piano sits by the front window so I can play and feel like I am in my garden, which is usually in bloom with seasonal flowers. The Marvin windows give a great view of our front garden and allow natural light to flow in, making the space crisp and bright. 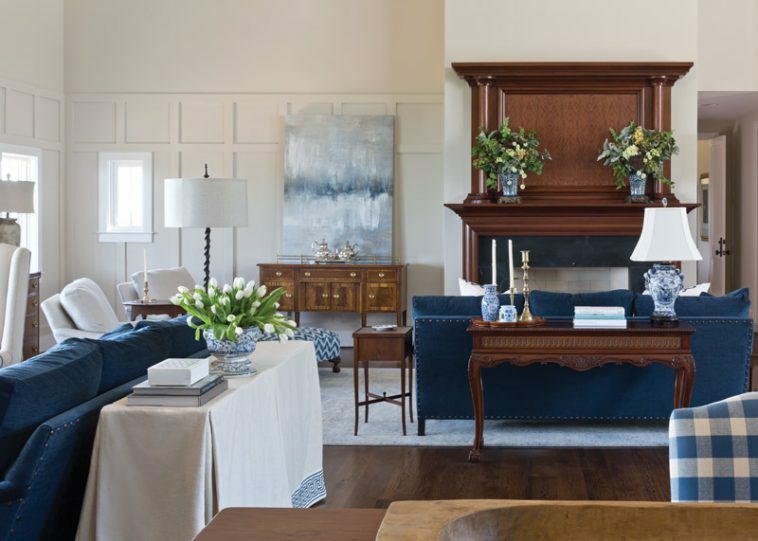 One of the main focal points of my living room is the vintage mahogany mantel, where I love to display fresh flowers in my blue and white china vases. The mantel is from an old home in Birmingham, and it’s thrilling to have a piece of history in our home. 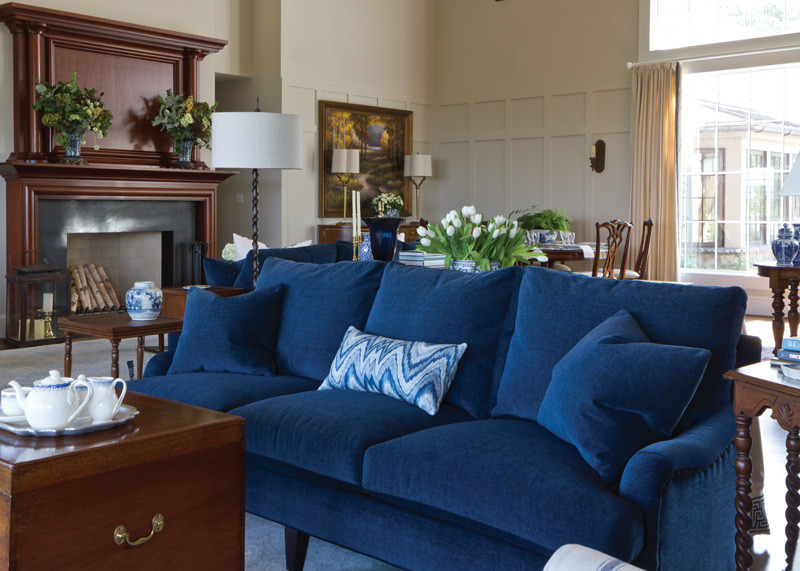 My navy blue sofas are from Lee Industries, and they provide great places to entertain guests. A small group can chat by the fireplace while another group can enjoy views of the back terrace, walled rose garden, and the beautiful valleys and mountains beyond. 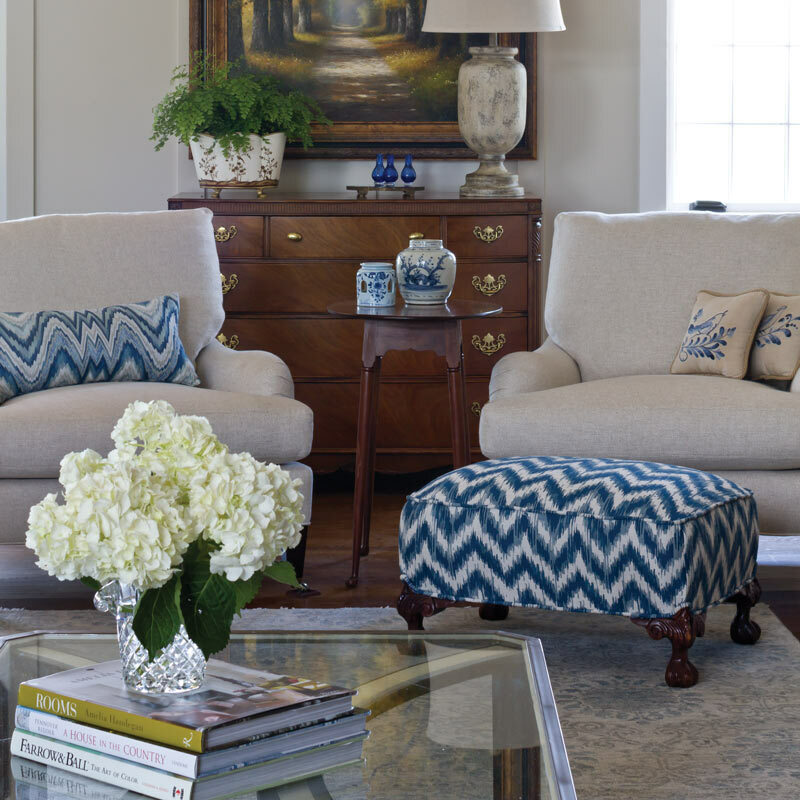 The armchairs in this space are neutral in color with touches of blue in accent pillows and ottomans. Across from the mantel, my living room connects to the kitchen with a large, stone-lined opening. A reclaimed header beam from an 1860s factory in Mississippi sits on top. To see my kitchen, visit this blog post I wrote on my amazing Viking appliances and kitchen layout. I wanted my kitchen to be a part of our living room so that when we all gather, we feel as though we are in one room. My family guests always want to be in the kitchen with me, so this works perfectly for me. Throughout my entire home, I have antique, walnut-stained hardwood floors from River Bottom Pine. In the living room, this really ties in the mahogany mantel and other furniture pieces. I love a medium brown floor because the wood grain shows. Sitting in the middle of the space, a dark wooden table displays some of my favorite blue and white china pieces from my collection. Neal and I found this farm table at Scott Antique Markets in Atlanta, Georgia, and my dad refinished it in walnut, resulting in a lovely table. 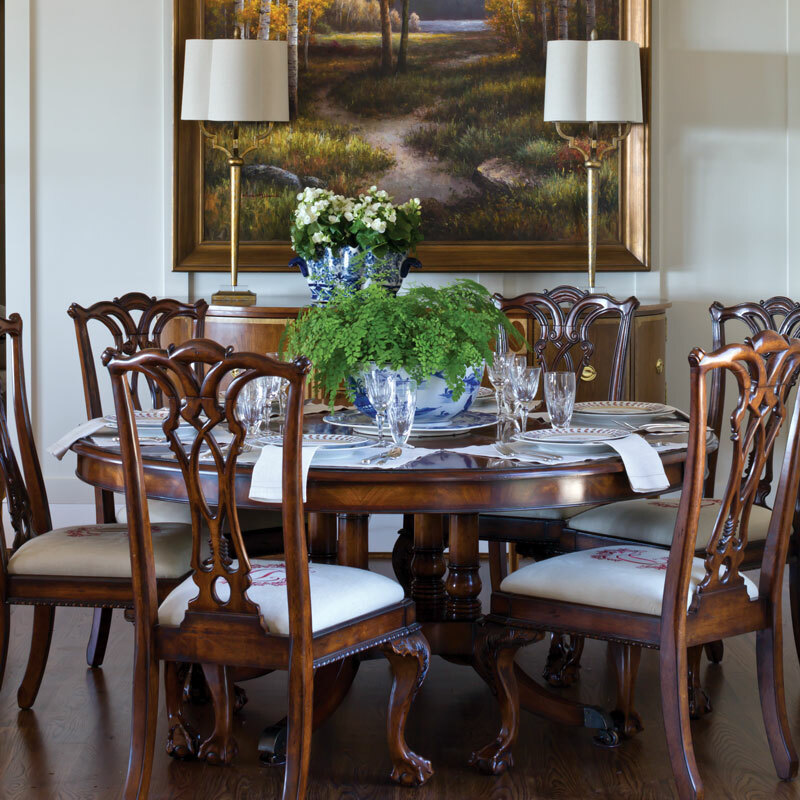 We always tell our guests, “You are in the living room, music room, and dining room… It’s all in the great room.” This open space works for our family as we love to gather in the same room. I placed wall lanterns around the room, and these lights are always on at night. It just adds a warm glow to the room. You should always surround yourself with colors and items that you love in your home. 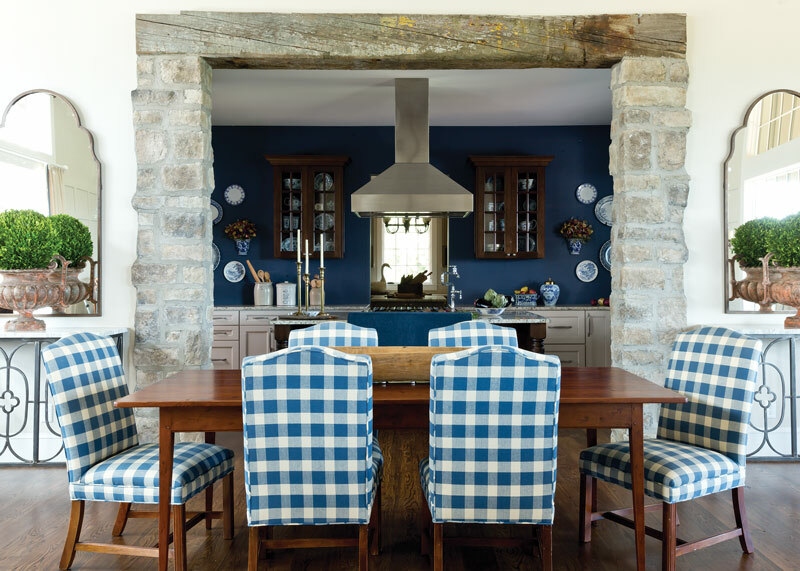 Blue and white is my favorite, as you know, and I just love the classic touches it gives my interior. 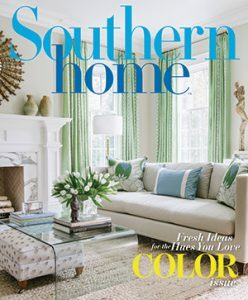 Make your home yours with color and collections. Stay tuned for more rooms in my new home! Wow, This blue and white combination for living room looks amazing. You did a great job. Such a beautiful open concept and so well thought out. The view from my window today is nothing but snow. I envy you having the lovely flowers of the South. Your magazines are truly masterpieces and wishfullness for me. Absolutely beautiful! Except…..where’s the clutter?!!! Just kidding. One question: Do you have trouble with the dining room chairs and the kitchen table chairs scratching the wood floor badly? How do you counteract that? I love your home and the beauty of your decorating to make it warm and inviting. Thank you for sharing with us. So beautiful and elegant. Phyllis thank you for sharing your home with us. Phyllis, thanks for sharing your lovely use of Marvin windows in your home! Wood is magnificent. You have placed it honorably. Thank you for sharing. Phyllis, your home is stunningly beautiful! beautiful and inviting room. Love the way you use blue and white, perennially gorgeous! When I saw you had posted a tour of more of your gorgeous home, I made myself wait for my evening quiet time. I put on your CD, curled up with my iPad, took a deep breath, and began a few minutes of joy, beauty, and sheer delight. Thank you for the blessing. It made my day. I look forward to our next tour. I love being a part of your dream come true. Thank you Sherry. Your comments mean so much. ‘Like it VERY much. It’s fresh and inviting. Congratulations! So,so beautiful, love the blue & white. Would love to visit!! Every thing I love, you have in one large space, a fire in the fireplace, a place to share a meal with loved one and a piano to lose your self in. A dream come true. Blue and white is such a classically beautiful, fresh color scheme! And, I love it with antiques! It is so nice how you took the architectural pieces and were able to incorporate them in your home. Beautiful. I’ve always looked forward to your blue and white issues of Victoria. It seems only fitting that your new home would reflect that timeless look. Beautifully done. That room is gorgeous. The furniture is lovely and that fireplace is so inviting. Your family and friends are sure to feel right at home when they step into your house. Your taste is excellent. I love everything about this room. It is so elegant. That piano is beautiful. You must make pretty music when playing the piano. Phyllis, that room is gorgeous. I love the blue[my favorite color ] and white theme. Thank You for sharing . What an elegant room dressed in blue and white! The view into the kitchen is so beautiful with loving stone details. Your home is a classic abode built with details of love and beauty and signature touches of historicity and preservation! You nailed it again ! EXquisite, yet comfortable and inviting ! this reflects lots of love and care in the planning and designing of your home ! Reflections of you ! Phyllis, the room is exquisite! Blue and white are timeless and perfect. Your dining table has a beautiful finish, how nice that your dad could do that. 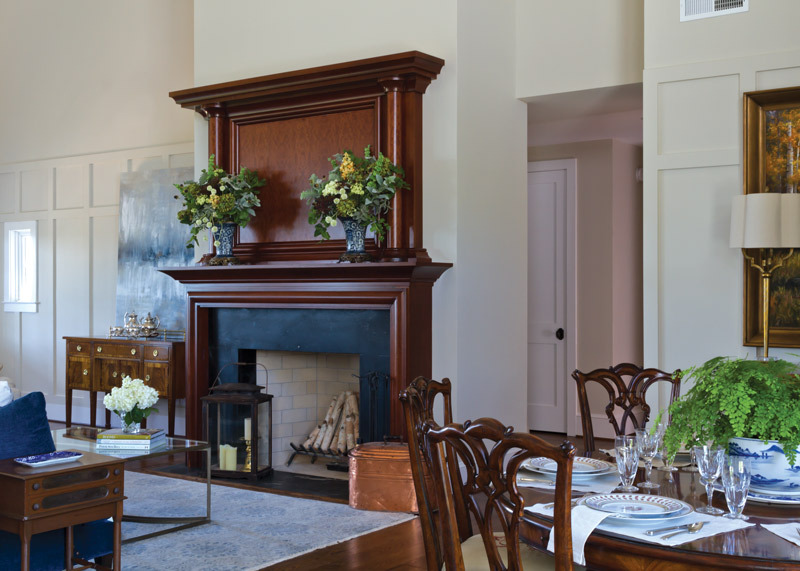 The antique mantel is the piece de resistance! Of course, as a pianist, the piano is is sitting in a lovely place with a view! Thank you for sharing your home! Now that is a very interesting thought. I never considered that!! Thank you. you playing it there. Thank you for sharing your home and talents! 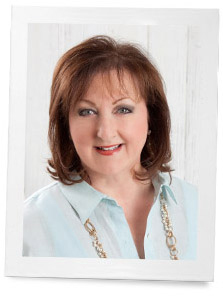 Dear Phylis, Blue and white are my favorite colors too and love everything about your beautiful home from the photos. My bedroom and a guest room are in blues with some navy blues in the library. When we moved from our farmhouse (mostly blues) to our victorian home twenty years ago, the kitchen had beautiful hand crafted stained glass cupboard doors in greens and rose so I had to give up using my blue dishes and started collecting jadite for every day use. I redecorated my outdoor patio room a year ago in my blues and it makes me feel so happy when I relax and entertain there. I have nearly worn out your CD “An Evening in May” playing it out there! Now I see your beautiful piano and think of you playing there. Thank you for sharing your home and talents! Thank you so much for your lovely comments. I appreciate your encouragement. A lovely room. You cannot go wrong with blue and white! Thanks for showing us your lovely home. I look forward to seeing more pictures in the future. Your home is so beautiful and so inviting. The blue and white is so classic and is such a compliment to your walnut mantel and floors. Love it! Phyllis, your home is lovely. I, too, love blue & white porcelain, fabrics, dark stained woods and natural lighting … well done! Looking forward to seeing other ideas you incorporate into your home. This is so beautiful! I love blue and white and checks. So warm and inviting plus gorgeous. I loved your kitchen and what you accomplished on your remodel. Oh my ! Such a gorgeous room! I live in a small apartment with my husband and his studio occupies part of our living/dining/entertaining room, so that area doesn’t feel as private as I would like sometimes. This is why I love my bedroom the best. It is my sanctuary, and although I share it with my husband, it is mostly decorated by my taste and needs. I keep it simple with calming colors and a meditation space. I often read in bed before going to sleep as it’s very quiet and relaxing in there. Currently it’s blue and white but I want to repaint it a soft violet and have chocolate brown, soft pink, and cream accents, making it sophisticated and feminine but not too girly. The blue and white theme throughout your rooms presents a peaceful unity in your home. I feel relaxed just looking at the photos you’ve shared with us. I love the warm pine wood and the unique stonework connecting your living room and kitchen. Your home is so inviting! My family’s favorite room is our open-area kitchen and dining room. When we bought our house, our first project was to remove a wall dividing the kitchen and dining room. The five if us love ” hanging out” in this area. Friends and extended family frequently remark on the pleasantness of being together in this open area( which also extends to our screened back porch… another favorite hangout ). I love the intentionality in your design choices! Such beautiful spaces for meaningful connections to come to life!